Slim Shady is spittin' rhymes all the way to the silver screen. 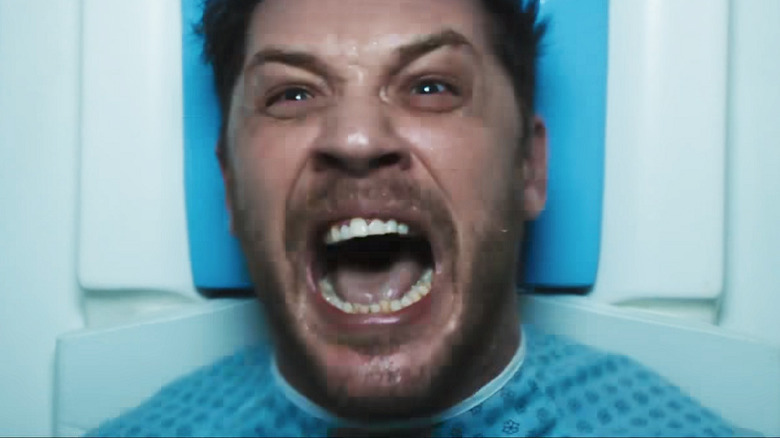 At midnight on Friday, August 31, rapper Eminem revealed that he recorded an exclusive track for Venom, the upcoming Sony film starring Tom Hardy as disgraced photojournalist Eddie Brock. The song is, naturally, titled "Venom," and is the 13th track on Eminem's surprise album Kamikaze. Eminem, whose real name is Marshall Mathers, first teased "Venom" on Twitter, posting a 15-second video in which listeners can hear him snarling the lyrics, "Venom, knock, knock, let the devil in," followed by the sounds of an animal roaring and a man crying out in pain in the background. An interesting bit of sound production, certainly, but not anything that would be out of place in the film that literally features a slimy symbiote threatening to eat a man's face clean off his head. By the time the chorus rolls around, however, listeners remember exactly who the track is about. "Venom, (I got that) adrenaline momentum / Venom, not knowin' with 'em / Never gonna slow up in 'em / Ready to snap any moment-um," Eminem raps. "Thinkin' it's time to go get 'em / They ain't gonna know what hit 'em / (When they get bitten with the— / Venom." And at one point, this piece of lyrical gold rises to the surface: "I'm the supervillain / Dad and mom was losin' their marbles to / You Marvel that? / Eddie Brock is you / And I'm the suit / So call me Venom." Eminem: King of Rap, or King of Promoting Movies? You be the judge. Eminem releasing "Venom" for Venom follows after rapper Kendrick Lamar and R & B artist SZA collaborated on "All the Stars," a track for Marvel's Black Panther, which opened in theaters back in February. Directed by Ruben Fleischer, Venom, featuring Eminem's "Venom," is due out on October 5.